Spend the morning or afternoon visiting Everglades National Park where you'll enjoy an exhilarating 1-hour air boat ride and alligator show. You'll learn about the impressive eco-system and see many animals in their natural habitat such as alligators, exotic birds, snakes and other reptiles. All entrance fees and hotel pick-up and drop-off are included. Your trip will start with a free Miami hotel or residence pickup. 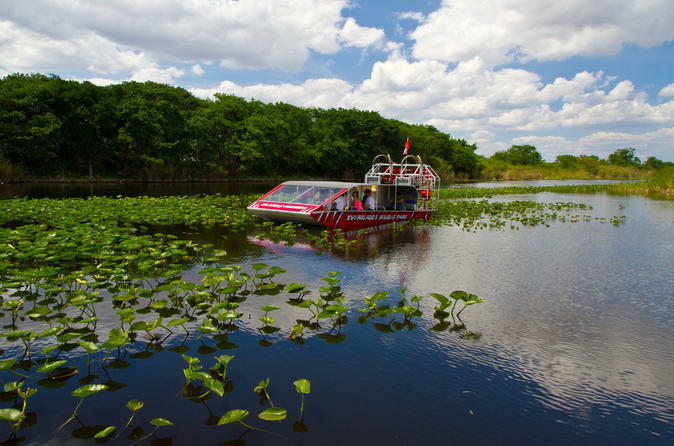 With miles of wetlands, you will journey deep into the Everglades, zipping across the “River of Grass” at top speed with an expert tour guide leading the way. Visitors will see alligators, exotic birds, snakes, turtles in their natural habitat for approximately one hour. After the air boat ride concludes, the excitement continues with a live alligator presentation. With adrenaline-charged fun, the Gator Boys and Gator Girls of "Animal Planet Channel" fame delight people with exciting stunts, tricks and important information about the conservation and preservation efforts surrounding the American alligator and the wetlands they call home.